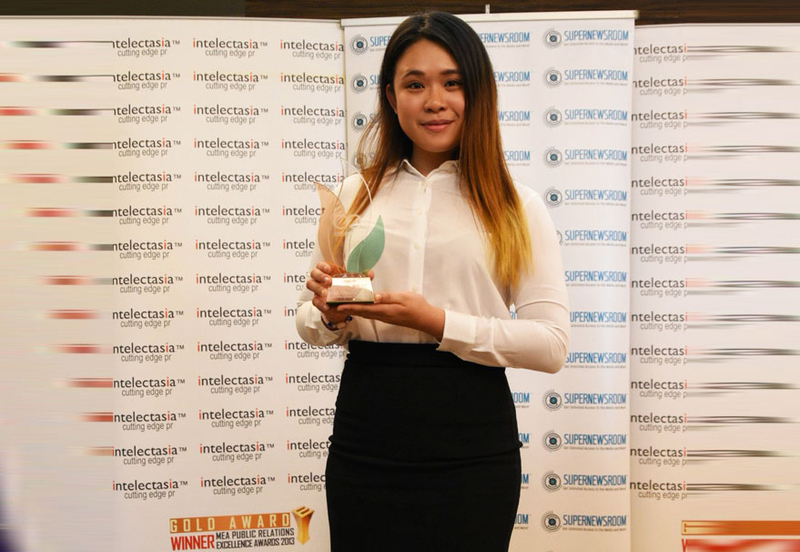 March was a celebratory month for UTAR Bachelor of Communication (Hons) Public Relations (PR) graduate Tham Lexuan when she was awarded the inaugural “Supernewsroom Young PR Professional Award 2016” on 17 March 2017 at intelectasia Consultancy. 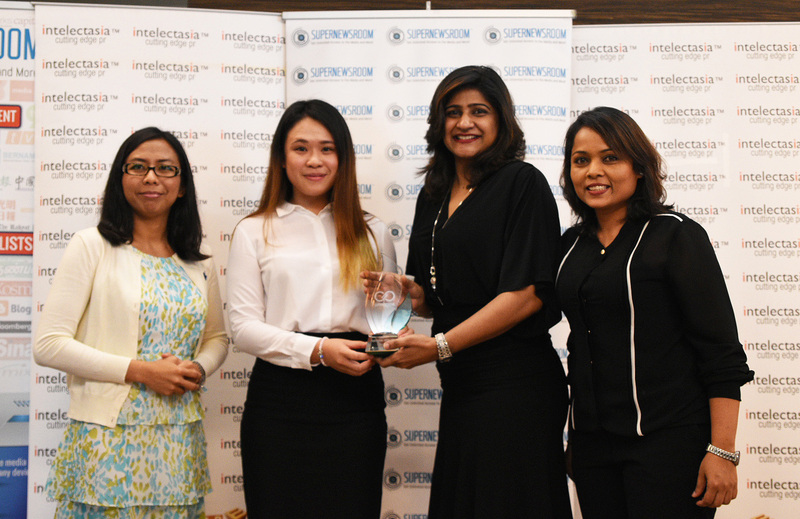 The award was presented by Chief Executive Officer (CEO) of intelectasia Consultancy and Founder of Supernewsroom Manminder Kaur Dhillon, who is also the Industry Advisor for UTAR’s Department of Public Relations. Also present at the award ceremony were intelectasia Chief Strategy Officer Puspavathy Ramaloo, Faculty of Arts and Social Science Dean Dr Alia Azalea and PR Department Head Pong Kok Shiong. As the first recipient of the award, Tham received RM500 cash prize. The girl from Perlis mentioned that it was her love for the PR programme that has made her excel in both her studies and work. “I am not a bookworm nor do I study much before the exams, but one thing for sure I always pay attention in my classes. It is also important to exert our 100% effort in assignments and presentations. From the hard work, I was able to score well in my CGPA and to finally graduate with first class honours,” the Honours with Distinction graduate said. Currently working at Huawei Technologies United Arab Emirates, Dubai, Tham also said that her active participation in extra-curricular activities, such as being the director for the PR Campaign Volunteerism V 2015/2016 has helped nurture her with the right PR skills, which also contributed to her win. “I feel honoured to receive this award. It is definitely an award that is able to motivate PR students and the future generation or even those who are interested in PR. I also believe this award is able to inspire the students to contribute to the society and to the PR industry as a whole,” enthused Tham. When asked of how the award would help in her career, she mentioned that the award is an acknowledgement and a testimony of her being an effective and passionate PR practitioner that will enable her to further contribute to the organisation she is affiliated with and the causes she believes in. Apart from expressing her gratitude to UTAR for the knowledge and skills learnt, she also advised her juniors to enjoy their study and university life. “Love the programme and understand it. Never regret your past decisions, but focus on the present. Always respect others and be trustworthy. Also, be humble and bold enough to step out of your comfort zone in order to leap through boundaries,” advised Tham. Dr Alia likewise commented that the award is truly a great way for acknowledging the PR students’ expertise and thanked intelectasia for the award. “I like this award for the fact that it is meant for a specific field, hence students are being acknowledged for their expertise in the PR field,” commented Dr Alia. “The award is about innovation and future. We wanted to acknowledge a student that embodies the same principles of what Supernewsroom is all about. We look forward to seeing the young and upcoming PR professionals and to recognise their talent, which I think will also inspire them to perform differently from their peers,” explained Manminder. An award winning PR firm, intelectasia Consultancy envisioned and developed Supernewsroom following the effort by a team of PR practitioners and journalists. It is a digital platform for media relations that allows collaboration and connection through crowdsourcing, which redefines the concept of PR to e-PR. Read about the previous visit by intelectasia here. Photos courtesy of Supernewsroom. For more photos, kindly visit Supernewsroom’s Facebook page.